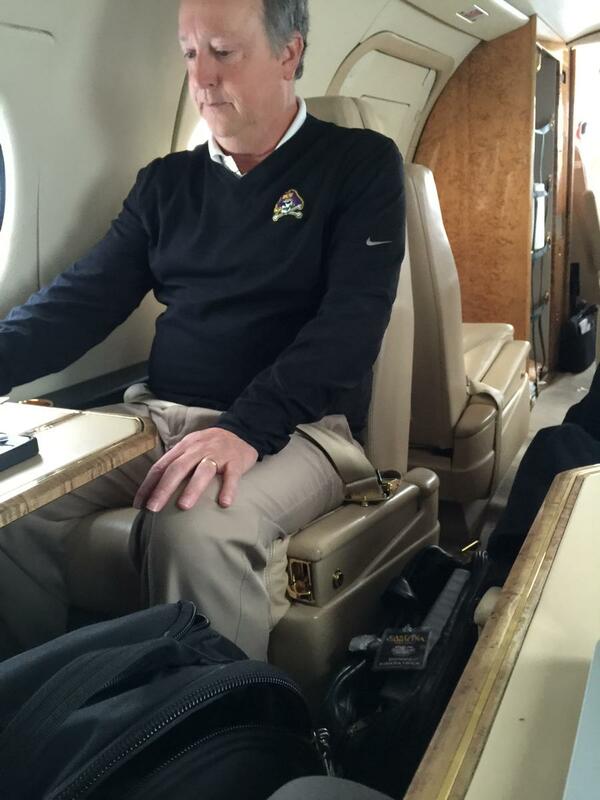 I cannot remember a time…ever…in my years of following ECU where a position group was as healthy as the wide receiving corps is in Greenville. 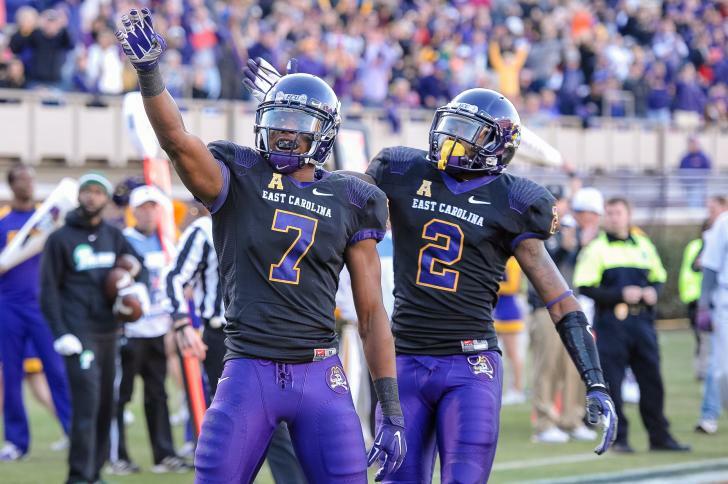 Now that said, in losing Justin Hardy, ECU loses not only a leader and an elite talent, but we also lose the crutch that the entire receiving corps always had to prop them up in the clutch. Still, IMO, there is so much talent there, that the offense probably does not need a Hardy-like receiver…the collective should be able to sustain. Cam Worthy, also graduating and likely to land on an NFL roster also, will also be missed. Yet, even losing two 1,000-yard receivers, there is experience all across the position groups, The Inside and outside positions boast a nice balance of experience, leadership, and burgeoning emerging and latent talent that the quarterbacks really should have no problem continuing Shane Carden’s passing distribution model…if they are in the line-up, they can catch passes and score points. Our Coack K: Tireless recruiter with an eye for the right receivers. While it remains to be seen what wrinkles, changes, twists, etc., come to the passing game by way of Dave Nichol’s promotion to OC, it is a good bet to expect that for the receivers, there will be supreme continuity. Yes, Garrett Riley – brother to that other Riley guy – will be new to leadership at the OWR position group, he is well-schooled in the offense and the position group responsibilities. Further, though assistant Head Coach Donnie Kirkpatrick is tasked with the IWR group, his vast experience not only in coaching the group, receivers in general and his position as the key developer of receiver talent, but also as the recruiting coordinator should allow for the continuity these position groups need in the wake of the OC changeover. In short, this group is in great coaching hands even with a rookie heading up the OWR group. Unquestioned leader: Jones (shown with Hardy) must become even more of a leader in 2015. Back drop: You simply cannot replace Justin Hardy…you can’t and shouldn’t try. If another do it all, superman emerges organically…hooray! But rather, the group should look to find consistency across a talented set of receivers. The good news is that the returning experienced receivers aren’t just good…they are extremely good. Depth could be the preeminent question for this group. Obviously, you have Isaiah Jones – exceptionally productive and reliable – and Jimmy Williams who is ready for more reps and has shown to be a weapon. Then there is Bryce Williams who has also proven to be a weapon, but has been somewhat under utilized, or at the very least spotty in utilization. Beyond those three, you have potential talent, though the receivers expected to take a more prominent role in the offense have at least gotten tastes of real game experience. So, expect that as a group, the IWRs will be very good but do not expect the new QB to be zeroing in on one of them all the time when in the clutch (though there is one that may rise to that level). The IWR group needs a fourth guy to step it up. Isaiah Jones (JR): If there is a potential “clutch” guy across both receiver groups, it is Jones. Like Hardy, Jones came in right away and grabbed a role on this team as a true frosh. He has been spectacular at times and his bad days are well above average for a top-level college receiver. His passion is contagious and his work ethic already is the stuff that young players try to emulate despite his being only halfway through his eligibility. The 6-1, 188 pounder was just 170 yards shy of joining Hardy and Cam Worthy in the 1,000 yard club in 2014. In two years, not only has he started 22 games, he has piled up 143 receptions for 1,434 yards and 10 TDs, averaging a whopping 10.03 yards per catch for an IWR. Like Hardy, he catches with his hands and uses his body extremely well during the catch. 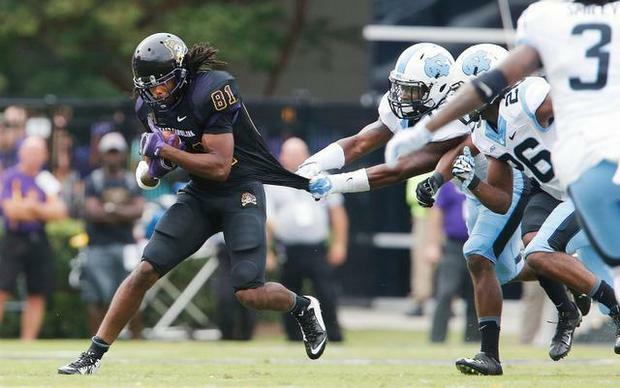 He may not catch Hardy’s numbers, but he will be up there in the ECU record books by the time he is done here. Most important to this team’s success will be his continued development as a team and position group leader. Game plan tweaking: Williams needs to be utilized more in 2015. Bryce Williams (SR): The bulkier 6-6, 250 pound TE/WR combo has been an effective mismatch for opponents, particularly in the red zone, but perhaps with Justin Hardy in the line-up, the mismatch was not drawn on as often as it could have been. Now, with Hardy plying his wares in the NFL (or soon to be), Williams is primed to become more of a staple in the passing game. He gets open, can run after the catch, and has very good hands. As a second-thought in the offense, he has managed to haul in 38 receptions for 457 yards and most importantly – 9 TDs – in his two years on the field. Expect that the new QB will target Williams more often. It would make sense if Williams final campaign is his most productive of his career. Healthy = Happy: Williams can wheel when he is on his game. 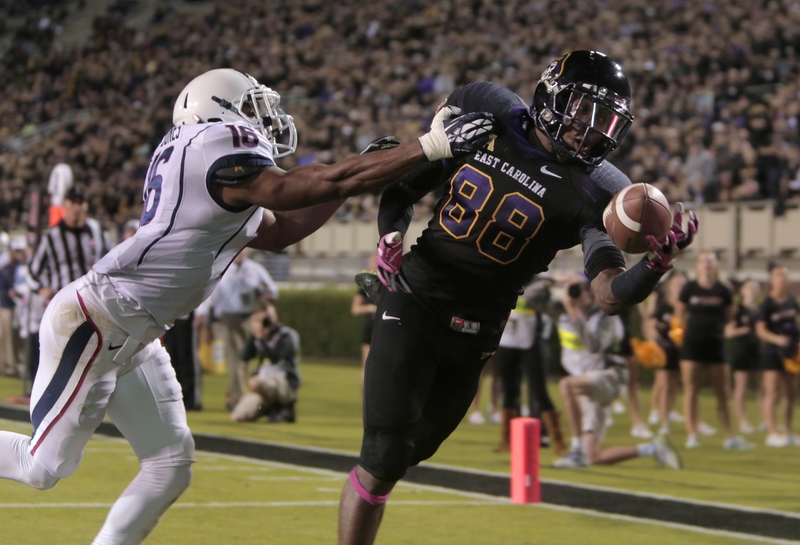 Jimmy Williams (JR): In his two seasons getting reps for the Pirates Offense, it has been good and bad news. The good news is that he is a talented receiver with very good hands, catching the ball away from his body and playing much taller than his 5-11 frame, thanks to long wingspan. He has a quick escape off the LOS and good acceleration for yards after the catch. The bad news is that in his two seasons on the depth chart, he has ended up injured, missing game time. As a sophomore, he missed most of the season after a foot injury and then missed game time in 2014 with another injury. He has been productive when on the field, having grabbed 27 catches for 320 yards (11.9 ypc) and a TD in 11 games over the two seasons, but must find a way to stay healthy and increase his impact when on the field. Cedric Thompson (SR): Thompson got first taste of action in 2013 and saw some time in 2014 as well, though he hasn’t had a ton of opportunities. In his two seasons of action, he has accumulated 6 receptions for 48 yards. Still, he has some good qualities to bring to the table including time in the system and he is a very physically strong receiver, rating out among the top S&C guys in his position group. Some guys peak later than others and there is a chance that Thompson could see more opportunities in his final go round. Another mismatch in the receiving game, Baggett can block and catch. Stephen Baggett (SO): Like Johnson, Baggett was too talented to tag with a red shirt. Primarily, the staff loved the 6-5, 220 pounder’s ability to block. Everyone knew coming in that he had great hands and managed to make the most of being targeted very sparsely, grabbing 2 catches for 27 yards. The good news is that he looks the part and can carry more bulk without giving up his pass receiving value (ala Bryce Williams). Getting on the field in 2014 was probably the biggest plus for Baggett, exposing him to the demands of this level of football so that he can orient himself now to competing for reps. Also, he gives the offense the option to go really big at the IWR position on both sides of the formation should the offense want to incorporate he and Williams in the line-up at the same time. Jacen Murphy (RS-SO): On a team where young players get their chance and flourish, the one player that a lot of fans are waiting to get his chance is Murphy. He is another in the New Hanover HS pipeline (i.e., DaQuan Barnes, Trevon Brown) that is pushing to get playing time. He was the team’s offensive scout team performer for 2014 and is chomping at the bit to get his opportunities, which will come in 2015-16. At this point, he is all potential, but as we have seen with the likes of Jones, Davon Grayson, Trevon Brown, etc., first year receivers have performed like veterans in this offense, so the odds are in Murphy’s favor that he can make an impact. Others: Darren Dowdell (RS-SO): A 6-4, 228 pound tight end hybrid receiver, Dowdell was set back in his development due to a leg injury in the spring. 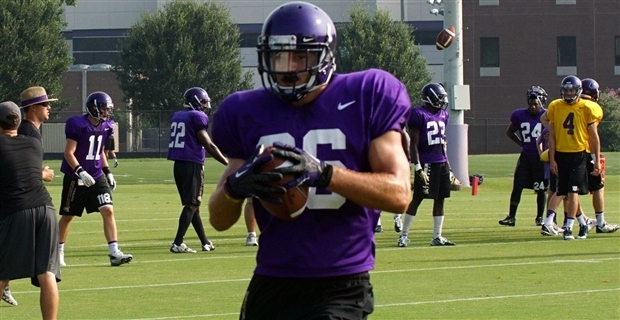 As a prepster was considered the 17th ranked TE in the nation, so he has potential. Jonathon Stanley (RS-SO): Walk-on from Richmond Senior; The rumor mill is also indicating that former standout Danny Webster (SR) may be reinstated to the team as a walk-on. If true, and if he is committed, he could be a game-changer for the Pirates in terms of experience and depth. Love or hate him, he was a play-maker. His impact on chemistry is the big concern. Early Call: How this unit performs in 2015-16 will largely depend on its top member. Isaiah Jones is the true class of the group and his leadership will be needed big time for the group to succeed. He has the potential to be the one that everyone in country is talking about next. He was highly effective and carved out his own name even in the shadow of Hardy and he wears his passion on his sleeve for everyone to see. He is a precise route runner, has great hands and extension, body control, and has the special abilities to help a quarterback look very good. As a leader, he has the attention of his teammates and will need to lead more than ever starting this spring. Bryce Williams hopefully will be targeted more as he has the luxury of being difficult cover for a LB or a small corner. He can truly turn a game, but has to have his chances to do so. Jimmy Williams should continue to improve so the big question is who will take that fourth spot? While the receivers could very well be shifted around but using the roster as it is currently, that fourth guy is likely Johnson though you gotta give Murphy the spring to possibly affect the DC.All in all, the group as whole is solid and if Johnson, Murphy, and Baggett can advance their games, the depth will be there too. Burst on the scene: Brown delivered on the potential and now must ratchet it up again. Back drop: In 2012, the OWR position was a true afterthought. Cam Worthy was only a shadow of what he would become in 2014 (a 1,000 yard receiving monster with big hands and big ups). The OWR position is still a bit of a shuffle, but the players there are mighty talented – providing that they all get healed up. Right now, if you look at the top guys in the position, you got talent but also injured talent. Starting with Trevon Brown who is the total package at OWR.Long, fast, great hands and provided a true, real vertical attack for the Pirates. But, he was also lost midway through the season. He had his shot because returner, DaQuan Barnes was lost to an injury at the start of the season. Both are big-time receivers whose health will determine the overall strength of the position. But there is more. Davon Grayson – who starred as a true freshman at the X position before an injury cut his frosh season in half – was moved to the other outside position at Z. The adjustment was obvious as an impact to his effectiveness, but he started to come on at the end of the season. Beyond those three, though, depth is a question mark. A lot of potential talent, but not a whole lot of experience there. Trevon Brown (SO): Brown burst onto the scene early thought his arrival was much heralded and fans got everything they had hoped from the true frosh from New Hanover HS. Brown was simply outstanding, creating a much-needed vertical threat, also displaying the abilities to make the difficult catch. He has a lot of areas to improve on, too, which means his ceiling still ahead of him. Though he only played in 8 games, he piled up 264 yards on just 14 catches (18.2 ypr) and added 4 TDs. Sky is the limit for Brown, if healthy. DaQuan Barnes (JR): Barnes finished 2013 getting better each outing and recorded 9 receptions for a 103 yards and a TD as a RS-FR. Unfortunately, he didn’t get on the field in 2014 due to an injury. His blazing speed and strong hands will be needed in 2015 as he looks to build on a promising start to his career in 2013. Getting it down: Grayson now has the experience to play inside or out. Davon Grayson (JR): Lincoln Riley was hopeful that Grayson could make the transition from dynamic IWR to deep-threat OWR in 2014 and he did make the transition. However, it showed early on that it was not an easy switch for Grayson who was a stud through 5 games as true frosh in 2013 at the IWR spot. Still, when Brown was injured, Grayson stepped up his game and finished with 25 grabs for 257 yards, bringing his career totals to 43 receptions for 433 yards (10.1 ypc) and 4 TDs. Nice numbers to build on and Grayson’s wildcard is that he is a true passionate player who doesn’t have to be the star. Whether he moves back to X or remains at the Z position, Grayson stands to only get better each time out. He will have a big impact on the 2015 season. 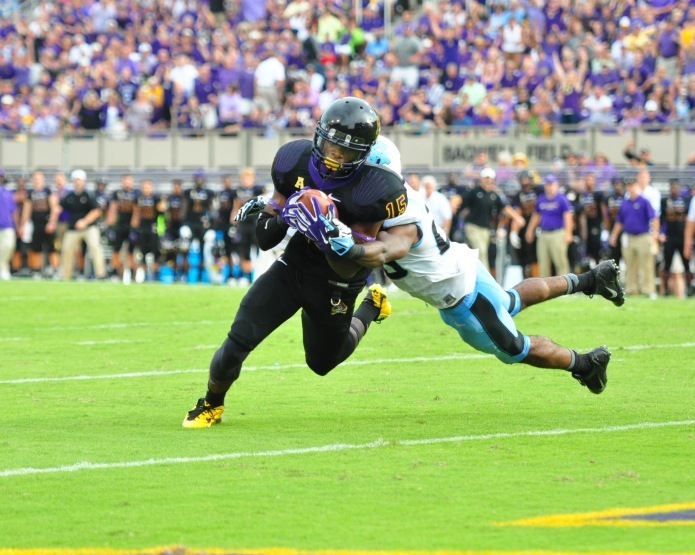 Preview: Bishop made a statement in his TD against North Carolina…is there more to come? against North Carolina just before the half in that 70-41 blowout in Greenville, Bishop came up with the big play, hauling in his only reception of the season – a 19 yarder for a score. If your deep bench guy can come in cold and make that play, it speaks volumes for the depth of skills. Bishop may not get a ton of chances, but that play demonstrated that when he does, he will be ready to deliver. Terrell Green (SO): OK…I get that we were starting to run short of receivers, so ECU lifted Green’s red shirt so he could play very sparsely in 7 games in 2014. Good move or not, one thing for sure is that Green looks like he is going to be a special talent. Riley in calls with him this past season would seem to slip in a quick, “wait till you see Terrell…” The former OC was very high on his talents and why not? He’s a 6-4 (maybe slightly more), long-armed flyer who can stretch field AND can go up for big plays. He is going to be a fun one to watch emerge over the next two years. Others: Curtis Burston (RS-FR), a 6-1, 220 pounder who the coaches had a very hard time keeping a red shirt on this past season. Malik Gray (RS-FR) who the coaches have credited with developing well and contributing on the scout team, and transfer Dwayne Duckett – a former walk-on at South Carolina – round out the roster at the OWR position. Early Call: It is all about health at the OWR position. Losing Cam Worthy hurts from an experience point of view, but the returning players at the top of the DC, have more pure WR skill and experience than Worthy had coming into his junior season. If Brown, Barnes and Grayson are healthy and operating at the top of their games, the OWR position will certainly be comfortably strong at the top of the DC, but real strength will be gleaned from what the guys beyond those three do this spring and beyond. Green and Burston have to rapidly evolve to provide the Pirates with the kind of depth that helped us sustain the attrition – injuries and suspensions – that occurred in 2014. Further, a new QB cutting his teeth will require the receivers to play a heightened level in order to ensure the routine catches stay routine. What is great about this group is that they are built for the vertical game, something we struggled with over the last few years. If the next QB has the knack for the long ball, we have the weapons to complete the plays on the other end. NEXT POST: The Pirates next QB has a big luxury that Shane Carden didn’t really have…an experienced and talented offensive line that will be one year older. With four starters back and a former starter returning to the line-up the first five are absolutely experienced and cohesive. Depth will be the storyline for the ECU offensive line.